In the Preface to volume 1 of The Consolidated Treaty Series, Clive Parry explained that his collection purported to make the historical treaties antedating the League of Nations Treaty Series available to the modern reader. By this, the date ad quem, 1919, of his work was made self-explanatory. To justify his choice of the date post quem, 1648, he succinctly stated that this was ‘classically regarded as the date of the foundation of the modern system of States’. To Parry, as to many of his predecessors, 1648 was the natural point of departure for modern treaties. It is indeed a commonplace among students of international relations and law to indicate 1648, the year of the Peace Treaties of Westphalia, as the very birth year of the modern states system of Europe, to the point that ‘Westphalian’ has become a buzzword for the system itself. The underlying claim is that the treaties inaugurated or even created a new international order based on the sovereign state. It is held that the treaties which put an end to the Thirty Years War (1618–1648) terminated the last great religious war in Europe and sounded the death knell for the universal authority of the pope and the emperor. Thus the princes and republics of Europe achieved their full sovereignty and a new international political and legal order which was premised on the principles of state sovereignty and religious neutrality emerged. As the modern state system was one in which, absent any supranational authority, states were left to their own devices to organise and regulate their mutual relations, horizontal agreements through treaty played a central role in the articulation of international order and treaties became its primary source. Over the last two decades, the communis opinio among scholars has fallen under attack. A number of scholars have stated that the new order which Westphalia inaugurated had little to do with that the sovereign state system, which only emerged in the 19th century. According to those scholars, the idea of Westphalia is a case of ahistorical myth-making to provide the state system with a clear starting point. But the criticism can even reach further, to the outright negation that Westphalia created anything like a new order at all. Indeed, any student of international relations or law who is familiar with the literature from international relations and law and who turns to the text of the treaties of Münster [1 CTS 271] and Osnabrück [1 CTS 119], 24 October 1648 – the two instruments which are commonly referred to as Westphalia – is in for a surprise. He or she will not find any mention of state sovereignty or religious neutrality as principles of international organisation in the texts, nor in the surrounding diplomatic documents. Neither will he or she find that the Westphalian Peace Treaties were universal peace treaties, to which most of the powers of Europe supposedly acceded; nor will he or she be able to pinpoint a reference to the balance of power, as so many scholars have claimed. Westphalia is indeed a myth, and one which has particularly little basis in historical reality as far as the Peace of Westphalia is concerned. In truth, there is very little that is ‘Westphalian’ about Westphalia. Much of the confusion comes from the hybrid character of the two peace instruments, which has often been overlooked or misunderstood. 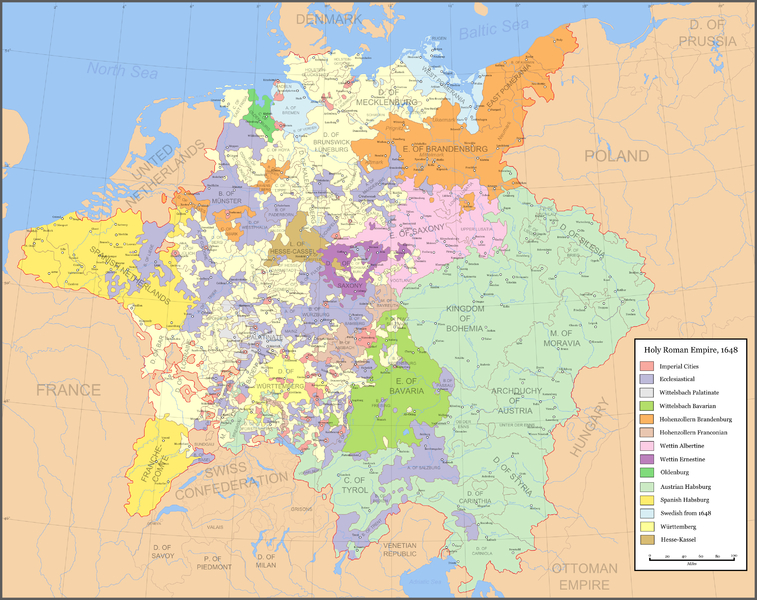 The Peace Treaties of Münster and Osnabrück are of a dual nature. On the one hand, they are bilateral international peace treaties, that of Münster between the Holy Roman Empire and France, that of Osnabrück between the Holy Roman Empire and Sweden. On the other hand, they constitute an internal peace agreement between the emperor and the hundreds of Reichsstände, the constitutive parts of the Holy Roman Empire, which spelled out a new constitutional and religious settlement for the Empire. The clauses into which later scholars have read references to state sovereignty or religious equality all pertain to the latter dimension of the treaties and hold no reflection on the international order of Europe or the law of nations. Modern scholars have considered the involvement of the princes and estates of the Empire in an international peace treaty and the explicit confirmation of their right to make treaties to mark the final rejection of the universal authority of the emperor and the recognition of state sovereignty. In fact, these reminiscences were nothing but the confirmation, or at best adaptation, of old pre-Westphalian rights and went a long way to sustain the medieval, feudal, hierarchical structure that was the Holy Roman Empire. Inasmuch as the treaties had anything to say about sovereignty, it was to reject its ‘Westphalian’ character. Moreover, a comparison of the ‘international’ clauses of the treaties with older treaties teaches that they differed in no way from traditional peace treaties. A historical study of treaty practice should thus move beyond Westphalia and look for the origins of modern treaty-making in the Middle Ages and the 16th century. 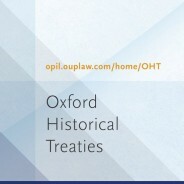 With time, Oxford Historical Treaties will therefore expand beyond the date post quem of Parry’s collection and include pre-Westphalian treaties. All this does not suffice to dismiss 1648 as insignificant in the long-term history of the political and legal order of Europe. The mid-17th century certainly was a period of transition between political orders and Westphalia is as good an event to symbolise this as any other. The Westphalia Peace Treaties indeed ended the last great religious war in Western Europe. At the same time, they fell within the middle of a period of civil unrest and war in many European countries (1640–1668), which in the case of some of the major powers ended with the victory of the forces of centralisation over local and regional autonomy. Westphalia, together with some other events, marked the end of a period of turmoil that had started with the Reformation in the second quarter of the 16th century and which had destroyed the medieval order of Europe. After more than a century of unrest and instability which had impeded the formation of a new consent about the international order of Europe, Westphalia helped to create the conditions of internal stability which in the following decades allowed for the articulation of a new common order of Europe. No peace embodies this order more than the Peace Treaties of Utrecht (1713) [e.g., 27 CTS 475 and 28 CTS 295]. This new order thus only materialised after Westphalia rather than at Westphalia. It was the order of the territorial dynastic state – which Bobbitt referred to as the kingly state – and the public law of Europe, which in turn was to be transformed by the French Revolution into that of the nation-state. Headline image credit: Ratification of the Peace of Münster between Spain and the Dutch Republic in the town hall of Münster, 15 May 1648.. After Gerard ter Borch. Public domain via Wikimedia Commons. It may not have been as Westphalian as traditionalists might wish, but it did result in the little gem of a painting by Gerard ter Borch, reproduced here. No recompense for one of the most disastrous wars in history, but more than most peace treaties can offer.